The issuance and disclosure of tax allocation bond (TAB) debt since the dissolution of redevelopment has brought challenges to communities throughout California, ranging from difficulty obtaining accurate project area information to lack of guidance regarding important issues like tax increment limitations. To aid city and county staff who are at the front lines of bond issues, the California Redevelopment Association (CRA) presented training workshops in Southern and Northern California, led by leading experts and practitioners, to provide an in-depth look at TAB bond administration, refunding and continuing disclosure issues. David McEwen, partner at Stradling Yocca Carlson & Rauth, led the first panel: “Existing Bonds: Fitting the Square Peg into a Round Hole,” featuring presentations by Barbara Boswell, Finance Director for the City of Lancaster, and Seifel Consulting President Libby Seifel. Their session presented recommended best practices regarding how to assure sufficient revenues are available to meet bond obligations through the ROPS process, legal requirements for the use of existing bond proceeds, and what to do when the IRS comes knocking. Workshop luncheon speaker Brent Hawkins, Partner at Best Best & Krieger LLP provided an update on the latest developments on State legislation and pending legal cases related to redevelopment. Joseph (Joe) Coomes and Libby Seifel also presented the findings from ULI’s upcoming publication on new tools and strategies to promote economic development and build sustainable communities. 1) provide tools to public agency staff to elicit the best quality from the private sector and 2) help strengthen relationships and collaboration across City departments. 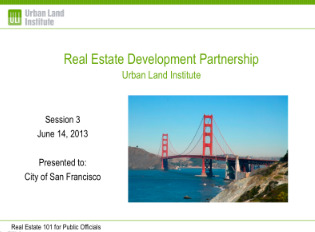 Libby Seifel in collaboration with Landon Browning of Lennar Corporation developed the training materials and taught the first three sessions on the basics of real estate finance and development.